This is the second of two floral mishima platters I've made. I really enjoyed doing the floral border on these pieces and look forward to exploring this a little more. These pieces are part of a wedding registry for a friend and former neighbor. I was really tickled to be asked to make pieces for her wedding! And silly as it may seem, I'm as proud of this solution as I am of some of the delicate pieces I've been making. I've been making butter crocks for years but have struggled somewhat with firing them and figuring out which surfaces remain unglazed. 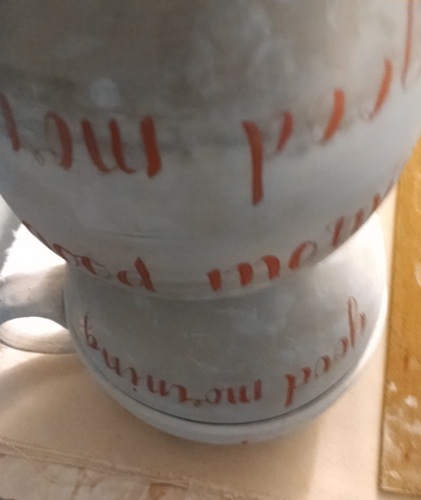 I used to leave the rim of the cup that holds the water unglazed and fired the pieces assembled, but I had a few pieces that stuck together on the inside. I used ceramic stilts to hold the butter cup up, but had to grind down the burrs from the stilts. I'd finally settled on using shelf supports to hold up the cups on the unglazed rim, but I'm at the point where I need all of the shelf supports. So I started thinking about trimming chucks and decided to make some for glaze firing. I threw three wide cylinders, slightly flared out at the bottom, collared in at the top, to fit my butter crock tops. I bisqued them and used them for the first time on my last kiln firing. I was so excited that they worked well that I think I'll make a few more so I can fire more than three crocks per load. Sometimes it's the little solutions that feel best. . .